I always like to read a scary book around Halloween. 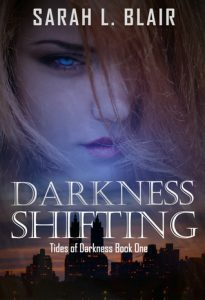 Sarah L. Blair’s book, Darkness Shifting, fits the bill. It reminds me a lot of The X-files, which I absolutely love. Yet, she manages to tie in something else I love: King Arthur. Just on this basis, this book was a complete win. The characters were developed well and I felt like I was part of their little group, trying to solve the mysteries. There were a lot of plot twists and turns that left me wanting more. And I will warn you: there is a lot of blood, gore, and violence. If you aren’t comfortable reading that, then please refrain from this one. I can’t emphasize enough how much I loved this book. It set me in the mood for Halloween and provided just the right amount of hot romance I needed. I truly can’t wait until the next book is released, and continues the story of Sidney Lake.